I need the following symbols for a class in crystallography, are there any package that contains them? 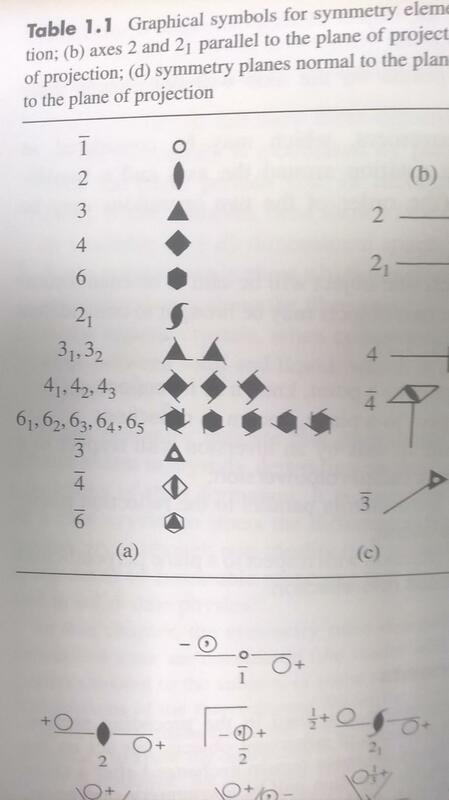 They are mostly needed for drawing figures in tikz as the numeral descriptions on the left will be used in text. I have not been able to find them on detexify, nor by googeling. Ul­rich Müller maintains a font package cryst for graph­i­cal sym­bols used in crys­tal­log­ra­phy, licensed under The LaTeX Project Public Li­cense. The files cryst.mf, cryst.tfm, cryst.afm, and cryst.pfb produce the graphical symbols used in crystallography to designate symmetry elements such as rotation axes, screw axes etc. (cf. International Tables for Crystallography, Volume A). cryst1.pdf contains a description (in German) and a listing of the symbols. Not the answer you're looking for? Browse other questions tagged symbols chemistry or ask your own question. How can I produce the symbols representing sign conventions for forces and moments in mechanical equilibrium equations? What characters are allowed to use as delimiters for BibTeX keys?